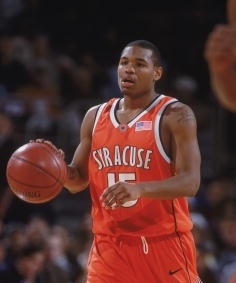 James Thues was a stocky playmaking point guard at Syracuse for two seasons. Thues looked to make the pass first, then took the shot if needed. He was not a great shooter, and was weak at the free throw line, but an excellent ball handler and solid defender. Though shorter than most guards he defended, Thues was able to frequently force the turnover. As a freshman, Thues was the reserve point guard, backing up senior Allen Griffin. As a sophomore, Thues would split the point guard duties with junior DeShaun Williams. Coach Jim Boeheim wanted to have both Hakim Warrick and Thues on the court, Warrick for his rebounding and size, Thues for his ballhandling. But with Williams and Preston Shumpert the main offensive cogs on the team, and Kueth Duany a solid defender and veteran player, he could not start both. Early in the season, Boeheim favored starting Warrick, though down the stretch Thues would start at the point, with Williams moving to the shooting guard, Shumpert to the small forward, and Duany to the power (Warrick still played plenty). Thues would transfer from Syracuse after his sophomore season to be closer to his hometown of Detroit. He would attend Detroit-Mercy, where he would start his junior and senior seasons. Thues would average 9.3 points a game, and 3.1 assists for the Titans, scoring 558 points in two seasons.